So, our first house is officially sold. As happy as we are that this has finally happened, I am also flooded with emotions. We are outgrowing this little house, but it was always so much more than just a house. It has been our home. Our first home we had ever owned. We were no longer renters. We took a big step into adulthood the day we signed those papers. So much excitement, fear, and uncertainty. This little starter home came into our lives at the perfect time. Just three months after losing our first baby, this house was such a happy blessing, and a great distraction from so much pain. We brought our sweet girl home to this house. We are fortunate to know the only two previous owners of the home. With that knowledge, we also know that Nora is the first and only baby to have been brought home here. That is just so special. So many happy memories in this house. Nora took her first steps on the hardwood floors. Many nights of dance parties, laughter, love, and big smiles happened here. We made some of our first big purchases; refrigerator, carpet, gutters. We learned so much along the way. This home has heard us cry many tears. All of us! Collin learned so many new skills. He didn’t have much of choice when we had just bought a house, were poor, and things were breaking! Many mornings were spent sipping coffee on the porch while Nora played. We would watch the big trucks and tractors drive by. So much growth as parents, spouses, and people has happened behind these walls. Yes, this home has been a blessing, a gift from above, but we take with us so many fond memories. I know we will make new memories in our next house, and I can hardly wait! I am so happy for you! I am also blessed that I was able to get glimpses into this special home that my grandpa built and I moved into my senior year of high school until I “flew the coop” into adult hood! It was in that living room that I told my parents I was expecting Lindsey… if only houses could talk! Blessings to you and your family! Awww, you’re making me feel sad to say goodbye to this house! It really is a special place and it has special memories for us too. Can’t wait to see how cute you decorate your new place. And the one after that, and the one after that. And of course, they will all be home once you and the ones you love are gathered there. 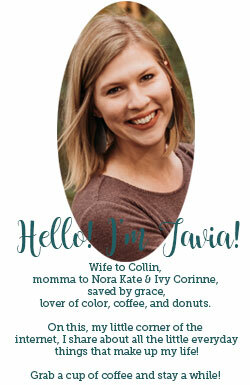 Hello Tavia! Love your posts! Just found them! My husband Danny and I, Brenda Allen attend LaCroix Benton, and we are so excited for you guys and the church and Gods great plans! Blessings and have a great day!